Blinding Rage - Get Rekt! Build: Blinding Rage - Get Rekt! 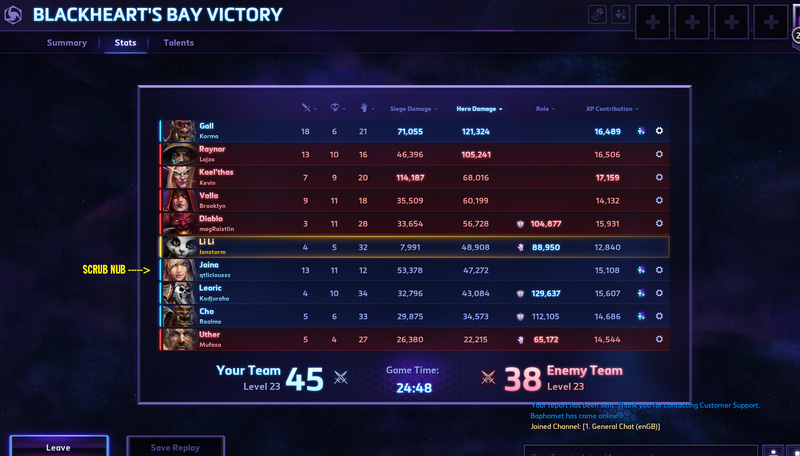 I'd imagine you know how to play Li Li, and you're here for a build that is incredibly strong. Basically all you do is build with the above talents, and by lvl 20 you're doing over 2k hero dmg per cast of blinding winds (provided you position yourself close enough to enemy heroes). It is a preventative damage build which slows and allows you to chase down (what with Li Li's movement speed increase from taking damage) this will allow you and your dragon to pretty much wreck any low hero on a chase. Also, you should be able to 1v1 any hero in-game provided you play right, obviously not Cho'Gall, and be careful of Artanis. Be at the front of pulls but play safely with a brain. Expect to do 40-50k Hero Damage per game, perhaps more depending on how long the games lasted for. For Early and Mid Game, you should be at the top of hero damage, even above Cho'Gall and you should generally switch lanes to where the action is, your fire and forget blinding winds will annoy the hell out of enemy heroes and the extra pew pew from the dragon will still help rail down a hero to medium/low for some assasin to jump in and lay the smack down. Don't expect a lot of take downs, but you should be very high if not top on assists. Yes early game you will need to keep returning home // shrine on cooldown, but it'll get to a point where you shouldn't need mana, and you'll be able to partake in 2-4 group fights before needing mana. Of course jungle / lane clearing for globes will help.